1 1/2 feet of Rope - 1/2" diameter. Blow up a balloon to the desired size for your pumpkin pail. Mix together 1 part flour with 3 parts warm water. Dip the paper strips, one at a time, into the paste mixture. Run the paper between two fingers to squeeze off the extra paste. Continue these steps until the balloon is completely covered. To give extra strength for the pail handle, Apply masking tape from the top of the balloon all the way around the whole circumference of the balloon and back the the top again. Paper mache another layer over the balloon, being careful to watch for and mark the direction of the masking tape strip. Before you do any painting, make sure that your pail is completely dry. It should be hard. Place the sock on your hand upside down, with the heel at your knuckles. Using your opposite hand, push the sock area, between your thumb and fingers, toward the palm of your hand. In doing this you should have created a mouth-like opening for the puppet. Put a pin through each side of the puppets mouth. Without changing the position of the mouth, carefully take the sock off of your hand. You should know what direction the masking tape is running from the top of the pumpkin pail. Do not cut those sides. Consider the masking tape a dividing line for the two sides in which you will make holes. Cut a hole in one side of the pumpkin, starting at about 1 1/2" from the top of the pumpkin pail, around to be about 4 1/2" to 5" in diameter. This piece will be the pumpkin top or puppet's hat. Glue a 1" wooden dowel or wood cork and an artificial leaf onto the center of the pumpkin top. Cut a piece of fabric that is long enough to be glued inside the circumference of your puppet hole all the way around, plus one or two inches, and as wide as your puppet's head and neck length. Using your hot glue gun, glue the edge of one long side of the fabric just inside the puppet hole all the way around. Then glue the ends of the fabric together forming a tube-like neck. Position your puppets neck edge just inside the open end of the tube or neck. Using a needle and thread, stitch the sock puppet's neck edge to the open neck end of the fabric with a running stitch (up and down stitch). You will have to gather large portions of the fabric edge with small portions of the sock as you go around since the fabric edge will be much longer than the socks edge. Put your hand into the puppet and determine the top of the puppets head. At the top point of the head put a large dot of hot glue and apply the pumpkin top or puppet's hat making sure that its placed in such a way that when you pull the puppet in, the jagged locations will match up and close the pumpkin top. To finish the pumpkin pail you will need to add the handle. Using a sharp knife, poke two holes through the sides with the masking tape in them at about 3" from the top of the pumpkin pail. 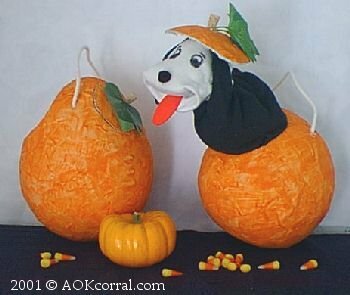 Insert each end of the 1 1/2 foot piece of rope into the holes and tie a double knot on the end of the rope inside the pumpkin pail. Kids can surprise their friends when they pop their puppet out of their Trick-or-Treat Pail.